Well, those lovable little yellow creatures are back again! Yes, the minions are back with another movie…Despicable Me 3 is coming to theaters this Friday! I don’t know about you, but I can’t wait. I think I like those awkwardly cute and lovable creatures more than my youngest daughter (and she thinks they are pretty cute and funny)! 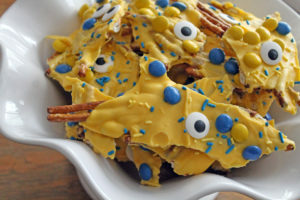 To celebrate, we made some minion mix…a sweet and salty treat that somewhat resembles those cute creatures. What do you think? 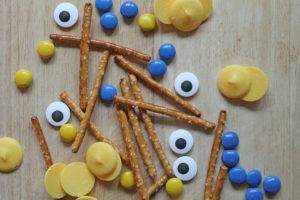 Love those eyeballs, huh? 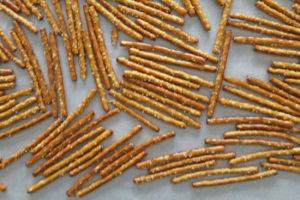 First, spread out the pretzel sticks into a single layer on parchment paper. Then, melt the yellow candy melts. 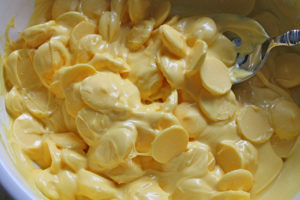 I do this in the microwave by heating the melts in a bowl for 60 seconds…take out and stir…then heat again for 30 seconds….take out and stir…continue this at 30 second intervals until completely melted. 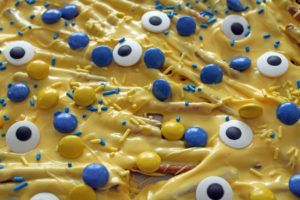 Once melted, pour it over the layer of pretzels. 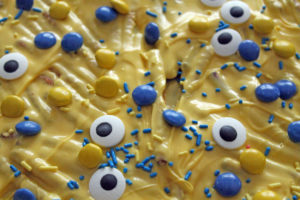 Decorate with the candy eyes, sprinkles, and M&Ms. Do this quickly before the melts begin to set. Allow it to solidify (you can place it in the fridge to speed it along, if you wish), and then break it apart into smaller pieces for snacking. So simple…even a minion could make it!